For the city in Argentina, see Villa Tulumba. For the department, see Tulumba Department. 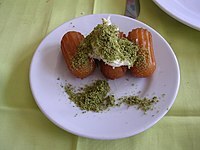 Tulumba or Bamiyeh is a deep-fried dessert found in Ottoman cuisine and the regional cuisines of the former Ottoman Empire. It is a fried batter soaked in syrup, similar to jalebis and churros. It is made from unleavened dough lump (about 3 cm long) given a small ovoid shape with ridges along it using a pastry bag or cookie press with a suitable end piece. It is first deep-fried to golden colour and then sugar-sweet syrup is poured over it when still hot. It is eaten cold. Tulumba literally means 'pump' in Turkish. The dessert is called pomba in Cypriot Greek and bombacık in Cypriot Turkish. In Armenian cuisine it may be called either pomp or tulumba (Armenian: թոիլւիմբա). Tulumba features in Albanian, Bosnian, Bulgarian, Macedonian, Greek (Greek: τουλούμπα), Azeri (Azerbaijani: Ballıbadı) and Turkish cuisines. The sweet is also found in Persian cuisine as bamiyeh (Persian: باميه‎). In Egyptian and some Arab cuisines it is called balah ash-sham (Arabic: بلح الشام‎), and in Iraqi cuisine it is known as datli (Arabic: داطلي‎). It is made from a yogurt and starch based dough, which is fried before being dipped in syrup. It is a special sweet often enjoyed at Iftar in Ramadan. It is also commonly served with its counterpart, the zulbiā, which is prepared the same way, but the only difference is that it has a web-like arrangement consisting of strips of dough. ^ "Muslims break fast on first day of Ramadan". USA Today. Associated Press. November 4, 2005. Retrieved August 19, 2010.